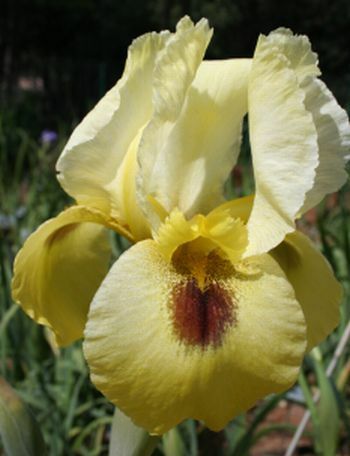 'Dresden Gold' OGB ( Doris Foster, R. 1974). Seedling 72-22-3. AB (1/2), 34" (86 cm). Early to midseason bloom. Standards pale Dresden yellow, veined deeper, ruffled; yellow styles; Falls deeper Dresden yellow; large, solid deep mahogany brown signal surrounded by dark brown dotting; gold sparkles on Standards and Falls; deep gold beard. Sibling to 'Moonspot' X 66-28-4: ( 'Bethlehem Star' x 64-4-3). Foster, 1975.